I went to my bookshelf tonight in search of an old copy of Phillips’ New Testament in Modern English. I opened its pages and, gently flipping through, was stopped by some neat, cramped handwriting I knew to be my grandmother’s. Turning to the front to confirm, there was the sticker, in the old-fashioned use of a husband’s name we too easily scoff at today: Mrs. Gerald E. Willhoft. Over the past few years I have become the inheritor of books from both sets of my grandparents. Growing old, paring down, they have made stacks and filled boxes and it has become known that I will take them. Almost all of them. Just this week my grandfather sent me a book from 1830, not knowing what else to do with it, but wanting it to be appreciated. Box after box of earthly goods have passed through my parents’ house, and I have sat many hours with my mother and sorted through it all. Kitchen goods and sewing items, furniture, antiques, pictures, gifts once given – now returned. It tells the story of their lives, and says something about life in its reminder that at the end we keep none of it. Much of it has continued on, gone to garage sales; but the books – I have a hard time letting the books go. I love their worn fabric covers and yellowing pages, their smell and their fragility. But most of all I love that they belonged to my grandparents. 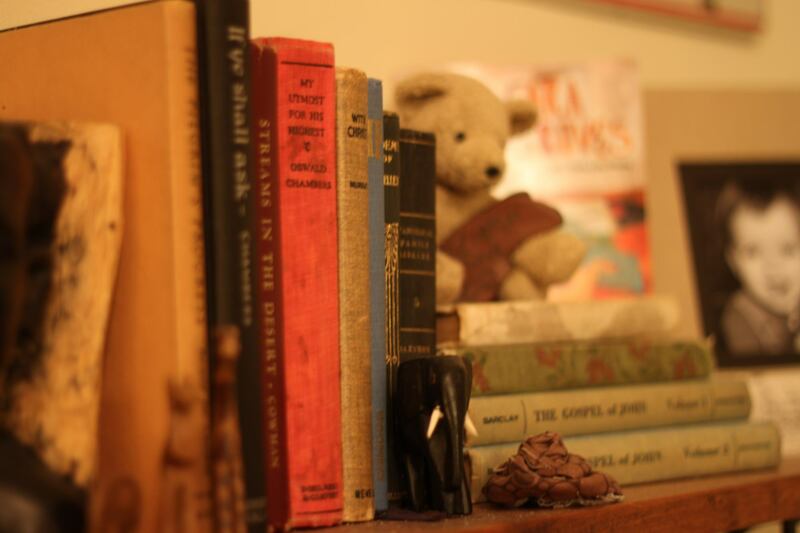 That before I was born, before my parents were born, they were read and treasured. Perhaps my grandfather pulled this one off the shelf to prepare a sermon one Saturday night. Perhaps one of my grandmothers stole a quiet moment away with this one, scribbling some words in the margin, reminding herself of the truth that is the same truth I receive. The only thing that doesn’t get old. 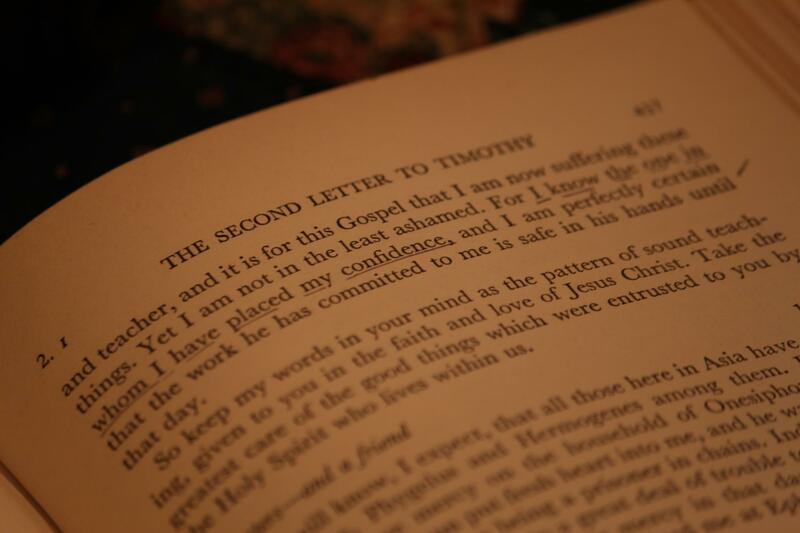 Maybe these books cause me to grasp at something timeless, the fact that in a world with almost no other similarities to mine, my grandmother underlined these words in Timothy, in her characteristic one-word-at-a-time underlining, and that I hold that same confidence. I stood there, staring at the small scripture references in the margin in my grandmother’s handwriting, and I wept. It was the first time, really. The first time that I cried for her since she passed away on Dec 20. Not because I felt nothing, or because I was experiencing denial, but simply because the mind that read these words, that rejoiced in them, that wrote a whole page, still tucked in this Bible, about the reason for suffering – we lost that part of her years ago. We had already grieved, for years, in that uniquely painful way of long illness and slow decline when the mind is first to go. But tonight I remembered not the years at the end, but the years before that. Tags: family, memory, stories | Permalink.